Home / Should You Recharge a Fire Extinguisher or Buy a New One? We have three fire extinguishers in our home. Two we bought new and one came with the home when we bought the place. This weekend, I was looking at the fire extinguisher that came with the home and noticed it had recently expired. As such, the effectiveness of the extinguisher to fight a fire could be compromised. Furthermore, national guidelines direct that if a commercial use extinguisher has expired it must be recharged. Because we like having three fire extinguishers in the home, I decided to look into whether we should recharge the fire extinguisher, or buy a new one. With the right tools and equipment, fire extinguishers with a metal head (valve assembly) are able to be recharged when they expire or lose their charge. Some fire departments will recharge them for a fee, however, more and more fire departments are opting not to recharge fire extinguishers due to the cost and liability. To recharge a fire extinguisher will cost between $20 to $50 dollars, depending on size. If you want your fire extinguisher recharged, then you should consider contacting a certified fire extinguisher repair company or technician. 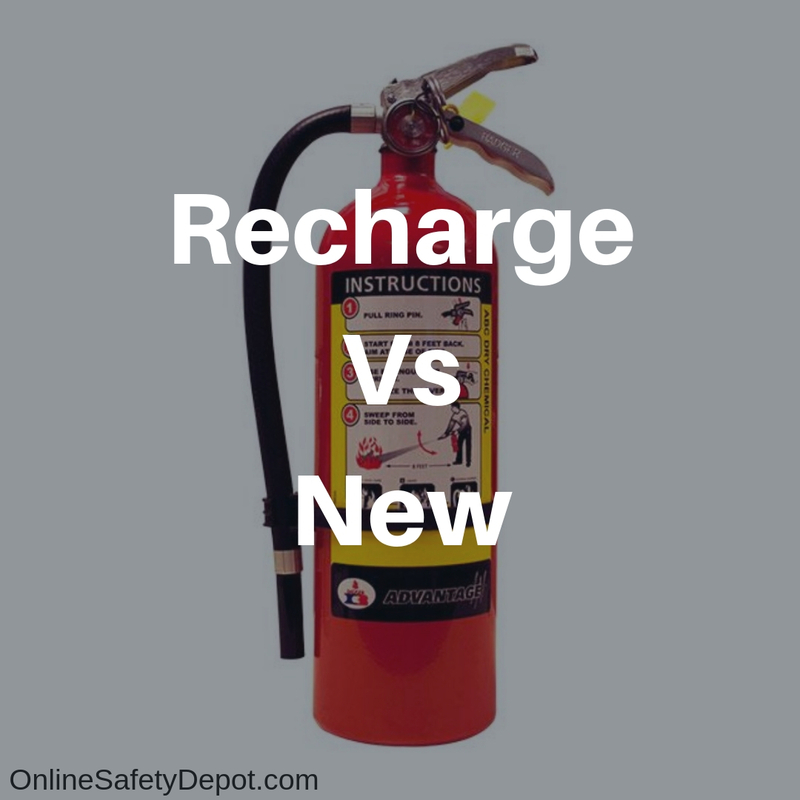 How to determine if your fire extinguisher needs to be recharged? There are a few indicators for determining if your fire extinguisher needs to be recharged or not. The first thing to look for is the tamper seal. If the tamper seal is broken or missing, then you should get it inspected to ensure that it wasn’t used, even a little. Next, you will want to look at the pressure gauge. If the needle is pointed in the middle of the green zone, then your fire extinguisher is properly pressured. However, if the needle is pointed near or in the red zone, you’ll need to get it recharged as soon as possible. Why you should not recharge a fire extinguisher yourself! To recharge a fire extinguisher, it must be the right kind of extinguisher. Fire extinguishers with a plastic valve assembly are not suitable for recharging. Fire extinguishers with a metal valve assembly are built in a way that they can be recharged. Additionally, to recharge a fire extinguisher requires specific training. If you have the right training and equipment then sure, go ahead and service the fire extinguisher yourself, otherwise it would be best to simply go to a fire extinguisher servicing company and have them do it for you. If the recharge is not performed properly, your fire extinguisher could leak and be ineffective when you need it most. It should be noted that if you recharge the fire extinguisher yourself, you are responsible for its effectiveness should it be used by another party. In essence, you could be held liable in the event it does not work, and there is a resulting damage to property or person. Price to buy a new fire extinguisher vs recharging an old one? The cost of a fire extinguisher depends on the size, classification type and intended use. Portable fire extinguishers come in a variety of sizes, with the most common sizes being 5, 10, and 20 lbs. The size/weight of the fire extinguisher is based on the weight of the extinguishing agent inside the extinguisher and does not account for the weight of the metal tank, valve assembly, or other components. Five (5) pound fire extinguishers are easier to handle and are great for the home, or even a vehicle, and are designed to be effective in extinguishing fires originating in smaller spaces or rooms, and will typically cost somewhere between $40-$60 dollars. The ten (10) pound fire extinguisher has double the weight of extinguishing agent compared to the five-pound fire extinguisher. These fire extinguishers are typically priced between $80 – $100 or more, and are also good choices for use in a home, garage, or shed. The twenty (20) pound portable fire extinguisher is even larger and is designed more for industrial or commercial settings such as a warehouse or commercial building. The cost of a 20-lb fire extinguisher is usually between $150 – $200+ dollars. The reason for the price range within each if these different weight classes (5, 10 and 20 pounds respectively) of fire extinguishers is due to the type of agent inside the tank, which then determines the type of fire it can effectively extinguish. For example, a 10-pound water fire extinguisher is less expensive than a 10-pound ABC fire extinguisher. Additionally, a 10-pound ABC class fire extinguisher is less expensive than a 10-pound Purple K fire extinguisher. These cost differences also apply to other size extinguishers. If you already have a fire extinguisher and are looking to get it recharged by a professional then it will likely cost you between $20-$50, depending on your area, the tank size, and the extinguishing agent. It is important to note that an inspection and recharge are different, and therefore the cost will be different. The National Fire Protection Association (NFPA) recommends that fire extinguishers be inspected at least once a year and will likely costs around $40 per unit. There are three elements to a fire extinguisher inspection. Visual Inspection: The visual inspection includes checking the tamper seal and safety pin, the gauges to ensure that the needle is positioned within the green or ‘OK’ zone of the pressure gauge, labeled expiration dates, and the metal cylinder tank to ensure there is no rust or damage that could affect the fire extinguisher in any way. Physical Inspection: The physical inspection is done by the inspector handling the fire extinguisher, reviewing the weight of the extinguisher, evaluating the quality or condition of the hose and the seals to ensure there are no cracks or other damage. Verification Inspection: The verification of the fire extinguisher is done by tagging or recording on the extinguisher inspection log, its location and the date of the inspection. This is to ensure that it hasn’t been moved and that it has had its yearly inspection per the NFPA and OSHA guidelines. The fire extinguisher has been used. Whenever a fire extinguisher has been used, it needs to be recharged immediately so that it is ready to go in case of another fire. Even if it was only lightly used, the extinguisher pressure may decrease over time. The next person the need to use the extinguisher arises, it may be unable to perform correctly and effectively due to reduced pressure or insufficient agent to extinguish the fire. According to the NFPA 10 codes, fire extinguishers need to be inspected internally every six and twelve years from the noted manufacture date, to ensure it is properly working and ready to work if needed. Fire Extinguishers also need to be recharged in the event of damage. Examples include dropping the fire extinguisher, the evidence of rust on the canister, or some other form of damage that could affect its functionality. As stated above, not all fire extinguishers are built the same, and each fire extinguisher classification is designed to extinguish a different type of fire. As such, a specific type of extinguisher agent may be effective against certain types of fires, and yet ineffective, and maybe potentially harmful, if used on a type of fire it is not designed to extinguish. Listed below are the various types of fire extinguishers and their unique characteristics that make them best suited for combating a certain type or types of fire. Regular dry chemical fire extinguishers are filled with sodium bicarbonate and are used in combating Class B and C fires. The sodium bicarbonate agent is non-corrosive, non-toxic and easy to clean after it has been deployed. The multi-purpose dry chemical is filled with ammonium phosphate and is used in fighting Class A, B & C fires. Unlike the regular dry chemical fire extinguishers, the multi-purpose dry chemical ammonium phosphate is corrosive. This requires that its residue be thoroughly scrubbed and cleaned from surfaces to prevent damage. Dry chemical fire extinguishers, both regular and multi-purpose, are commonly found in schools, homes, hospitals and offices. Carbon Dioxide – Carbon dioxide fire extinguishers contain an liquid form of C02. When the fire extinguisher is used, the C02 is deployed in the form of a gas, which is effective in fighting Class B and C fires. Carbon dioxide fire extinguishers are environmentally friendly because they do not leave any harmful residue when used. Carbon dioxide fire extinguishers are commonly found in computer rooms, laboratories and other areas where sensitive electrical equipment is found. This is because the C02 does not affect the computer or other electronic components whereas other extinguishing agents could. Water Extinguishers – Water fire extinguishers are effective in fighting class A fires but should never be used to fighting Class “B,” “C” or “D” class fires. The reason for this is because Class B fires involve flammable liquids such as oil, Class D fires involve metals such as magnesium, titanium and other metals. A good example to demonstrate this is oil from a ship that is burning on top of an ocean or lake. If you were to use a water fire extinguisher to fight these types of fires, the force of the extinguisher being discharged could spread the fire, worsening the extent and scope of damage. Class C fires are electrical fires and because water is conductive, the user is at risk of being shocked by the electrical current. Electrical fires are common in computer rooms, locations of faulty wiring, in motors or appliances. Being limited in their use, water fire extinguishers are usually less expensive than other types of fire extinguishers. Wet Chemical Fire Extinguishers – Wet chemical fire extinguishers contain potassium acetate as the extinguishing agent and are designed for Class K fires. Wet chemical fire extinguishers are ideal for commercial kitchens and restaurants where the fuel source of the fire may be oil, gas or grease. When the fire extinguisher is discharged, the potassium acetate is disbursed in a mist form which will not cause the grease fire to splash onto surrounding surfaces and cause the fire to spread. Additionally, wet chemical fire extinguishers can extinguish class A fires. Because the cost of recharging a fire extinguisher is considerably less than buying a new one, we recommend having your fire extinguisher routinely evaluated by a professional, and when applicable, recharged according to existing guidelines.